Design critic Alexandra Lange goes shopping for the perfect kids toy–and finds so much design falls short. Everything about them looked great. Automoblox share the traits of many toys sold at Giggle, the MoMA Design Store, and the overpriced kids boutique in your neighborhood: They are made of wood, the colors are bright and unisex, they use no batteries, they evoke the past, and they cost significantly more than the plastic, pink-or-blue, light-blinking, noise-making blobs sold at Toys R Us. These qualities explain why three different people decided Automoblox were the ideal gift for the offspring of an architect and a design critic. And yet, my son seemed perplexed by how to play with them, beyond rolling them back and forth, something any die-cast drugstore school bus can do. Automoblox promises creativity: “With Automoblox, your child plays outside the box—and builds the design pictured in his or her mind.” First, I think they are starting the advertising clichés a little young. Second, those design options are severely limited. You can exchange a sporty rear end for a utilitarian one, a green transparent cab for a purple one, one set of colored tires for another. But whatever you do, you get another car. It took my husband’s outside-the-box thinking to make the whole thing into a flatbed (it takes two axles and all the center sections). Then we had a pile of unusable spare parts, including those wheels, which seem designed to be lost (replacements are $10). The box promised interchangeability, but all the change was color, not function. Automoblox are really like dolls for (primarily, not to stereotype) boys. All you can do is change their outfits. Despite appearances, Automoblox are a trophy toy: all looks, no lesson. And as I survey the field of design toys for kids, I see too many other wooden, bright, no-battery, retro, expensive items that seem like no fun. It’s ironic that these are all aimed at the design-loving parent, because, with their emphasis on looks and embedded modernism, they are teaching precisely the opposite of outside-the-box thinking. I see my son gravitating toward two poles in toys, either the entirely abstract, like plain blocks or the very specific, like Matchbox cars or fake fruits or Fisher Price Little People (I bought him the 1974 airport on eBay–the toy I always wished I had). The plain blocks allow kids to make anything. The cars, fruits, or Little People help them pretend to be adults. 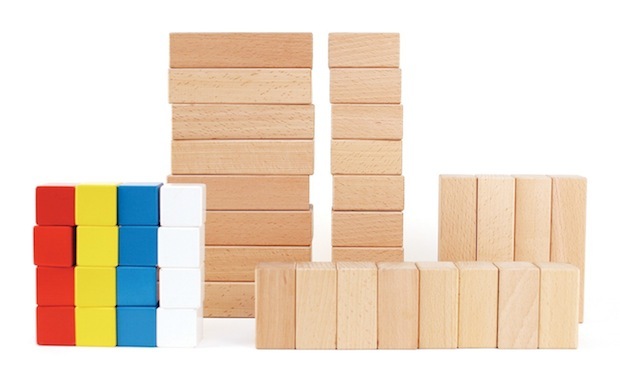 The blocks are totally modern–Frank Lloyd Wright played with unpainted Froebel blocks, Maria Montessori advocated toys with only one or two qualities that change (like blocks that were all square, all one color, but graduated in size). The cars and people, not so much. So Automoblox would not be allowed in that classroom, but the principle still applies. What’s problematic about Automoblox is partly that kids can’t exercise their own vision–all the cars come out looking like Corvettes—but also they also can’t play garage, or airport, or museum. The cars do too little. Other equally cool-looking toys, including seemingly basic sets of blocks, are gussied up with too much conflicting information. Take House Industries’ Alexander Girard alphabet blocks, for example. “For a child learning how to read or spell, the letters are too stylized. There is also no reason for the colors—i.e. vowels aren’t all one color,” Mahar says. They are another trophy, one that would look good piled artfully by an adult on the bookshelf. I suspect no child really wants to make the Eames House either, the theme of the latest (and sold out) set of House Industries blocks. If you want something that looks more fun than a Froebel set, better to buy the translucent Magna-Tiles (pictured below), or for smaller kids, buy the stackable SoftBlocks. At the Museum of Modern Art’s Shape Lab, many toys are homemade, like yoga blocks with magnets attached, which allow visitors to explore wall composition a la Donald Judd. They have also used Grimm’s wooden blocks (pictured below), which are vegetable dyed (since paint chips), and toys from Learning Materials Workshop. “Our focus is on the open-ended, to let visitors build on their experiences instead of the toy guiding what the experience should be,” says Elizabeth Margulies, Educator, MoMA School and Family Programs. I am not willing to ban representations of the man-made from my toy drawers. For a city child, I believe trucks, buses, rollers, and excavators are part of their natural world, and sometimes the farm focus of children’s literature can seem obsessive and out-of-place. There are a number of specific, operable, not battery-powered vehicles that let kids be in charge of their world, if not make it from scratch. Some are, however, plastic. In my house the unused Automoblox pieces get compacted in the Battat Garbage truck, a sturdy, not garish item that sells for less than $20, has an operable hatch, and even comes with two trash cans. There’s even an eco-version, a recycling truck made of recycled plastic by GreenToys (of course). From the moment he ripped open the box on the Battat, not for one instant was my son confused about its highest and best use. So buy the trophy toys for yourself–and don’t overlook the plain little cubes in the corner next time you are searching for the perfect toddler gift. Alexandra Lange is an architecture and design critic, journalist, and historian based in Brooklyn. Her work has appeared in The Architect’s Newspaper, Design Observer, Icon, Metropolis, New York Magazine and The New York Times. She is co-author, with Jane Thompson, of Design Research: The Store That Brought Modern Living to American Homes (Chronicle, 2010).